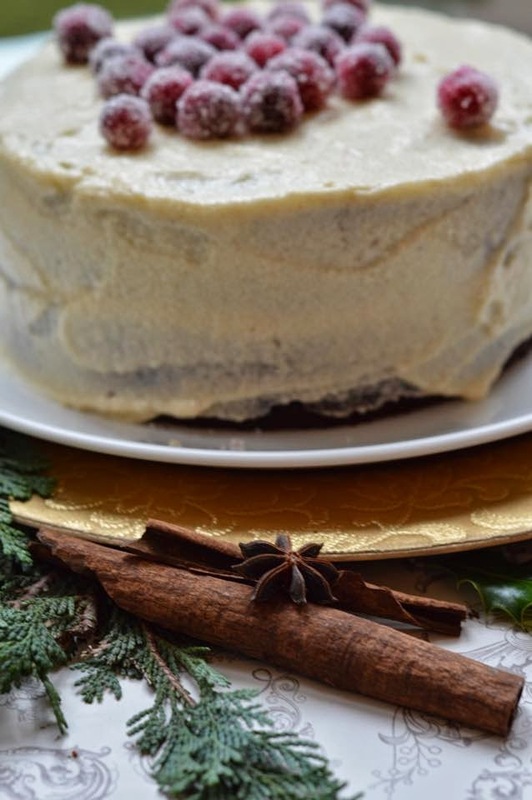 My fabulous food photographer friend over at Stem and Ginger, Karen, and I have collaborated to come up with a tantalizing alternative Christmas cake. One which doesn't need to be baked weeks or months in advance (who thinks about Christmas in September, really...?). And one which isn't your typical fruit cake laced with whisky, rich and ensconced in marzipan. 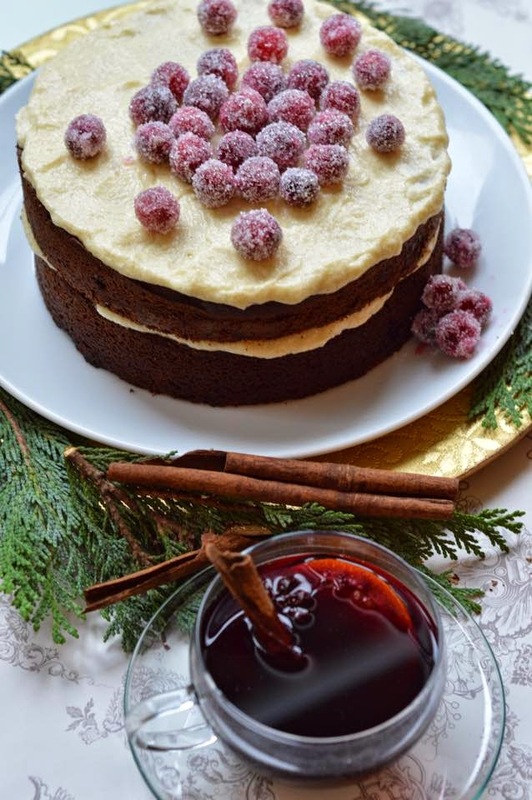 This, my friends, is Chocolate Gingerbread Cake, with Cinnamon and Honey frosting, topping with sugar-coated cranberries. 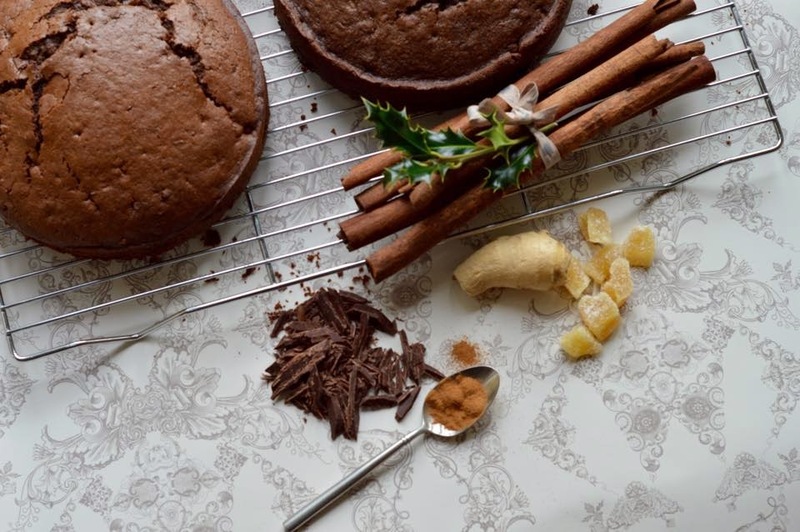 It merges all the traditional flavours; cinnamon, nutmeg, ginger, but also oozes the richness of a sumptuous chocolate cake, which, let's be straight with ourselves, is really what Christmas is all about. Chocolate. Cranberries are fabulous at this time of year, and their seasonality is short-lived, so make the most of them. Blue Kitchen Bakes is a big fan and so I've joined her Fresh Cranberry Recipe Link Up 2014, with these fresh (Ocado-delivered) cranberries, sugar-coated for a beautiful yet simple finish. My recipe, and Stem and Ginger's fabulous photos are featured in Fabric's Fabvent Calendar Day 9! Also featured on Acardia Online lifestyle website. Heat the oven to 180 C, and lightly grease 2 round 8 inch tins. Using an electric mixer, cream the butter and dark muscovado sugar together until light and fluffy. Beat in the eggs, followed by the buttermilk and molasses. The mixture may look a little curdled. Sift in the flour, bicarbonate of soda, cocoa powder, cinnamon, ginger, nutmeg and salt, and mix until you have a smooth batter. Fold in the crystalized ginger and chocolate, taking care not to over-mix. Divide the mixture evenly between the two tins. Bake for 35-40 mins, until a skewer comes out clean. Cream the cheese and butter together for about five minutes until soft and fluffy. Add in the honey and cinnamon and then sift in the icing sugar. Check the taste until you are happy with the sweetness, adding more icing sugar if needed. Beat until smooth. Once the cake has cooled, level off the tops. Smooth some of the frosting over the bottom layer, then stack the second cake on top. Coat the top of cake (and the sides if you prefer) with the rest of the frosting, as smooth as you wish. The cranberries are best prepared the night before to ensure complete sweetness. However, a few hours are also sufficient. Fresh cranberries are best of course, as they are in season, but frozen work as well, just remember to de-frost them a few hours before. Make a syrup by simmering the water and sugar together until the sugar has dissolved. Place the cranberries in a bowl, and once the syrup has cooled, pour over the cranberries. Allow to cool completely, then cover completely and refrigerate for a few hours, or overnight if you have time. Drain the cranberries (you can re-use the syrup). Place the extra sugar on a flat plate, and roll a single layer of the cranberries in it until coated, shaking the plate gently. Place on some greaseproof paper to dry for about an hour. 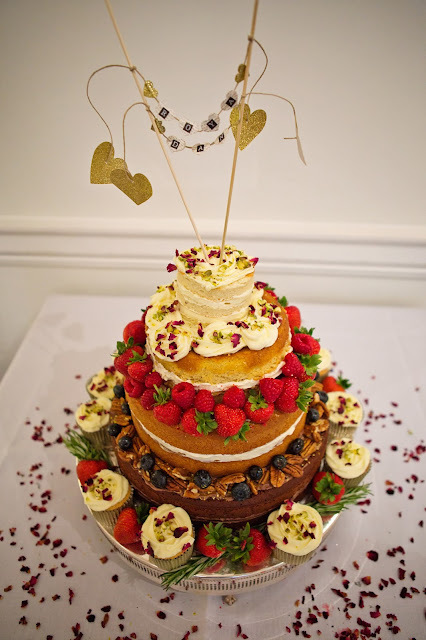 Once the cake is frosted, and the cranberries have dried, arrange on top in a random pile. Recipe by me, Photographs by Stem and Ginger. Thanks Jen, love your blog too!